Bruce Shapiro received his Bachelor of Science degree in Business and Distribution, and Education Degree, from SUNY Albany, New York. After four years of living in the Caribbean with his family on the island of Nevis, he returned to the US and began his career in the life insurance business. For the past 17 years, Bruce has helped thousands of people understand and invest in life insurance. Before entering AJRCA in 2008, Bruce had been a lay-leader at Congregation B’nai Israel in Tustin, California for 10 years. 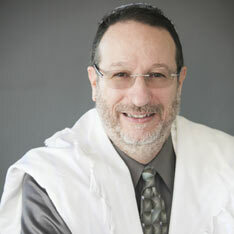 I have been the part-time Spiritual Leader/Cantor at Congregation Beth Shalom in Corona, CA. Prior to graduation from Cantorial School at AJRCA, I was a life insurance salesman for 17 years, while serving CBS part time since March of 2009. I am proud to serve Congregation Beth Shalom and look forward to working with other Rabbi’s, Cantor’s, Educators, and Laypersons in the area. Upon ordination, Cantor Bruce Shapiro will continue to serve Congregation Beth Shalom of Corona as its spiritual leader and Kol Bo.